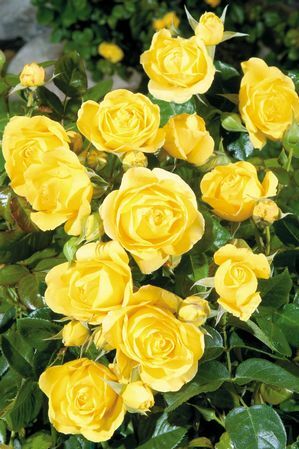 Walking on Sunshine is a great rose for the new rose gardener. It has fantastic bloom production, plant vigor and good disease resistance. Yellow, lighter outer petals, ages to light yellow . Moderate, anise fragrance. 25 to 30 petals. Average diameter 3″. Medium, full (26-40 petals), cluster-flowered, in small clusters, ruffled bloom form. Blooms in flushes throughout the season. Height of 4′ (120 cm).